as our garden season started very late, there is not a lot to harvest yet. but we have a lot of asparagus. some forgotten greens like chard, spinach, abandoned lettuces and rocket and of course, the spring onions. 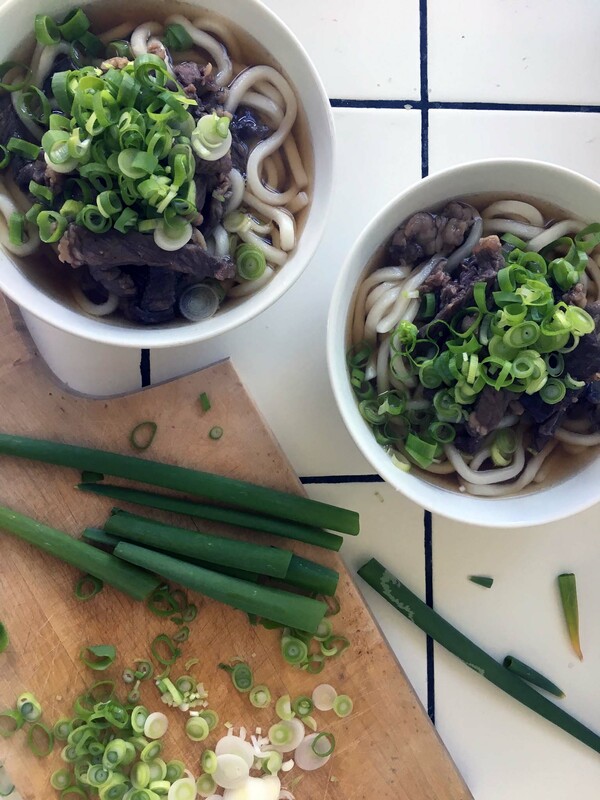 and as after two months in asia there is a huge desire for asian food and especially soups there is an excellent fit for the spring onions in this super yummy udon noodle soup. the broth is absolutely delicious, the beef soft and everybody with a favor for udon noodles doesn’t need more for knowing that this soup is a must. the recipe is from the tokyo cookbook by maori murota and tastes absolutely authentically. so enjoy while waiting for more greens in the garden. cut the beef in thin stripes. pour the beef together with the soy sauce, sugar and mirin in a pan. reduce the liquid while stirring constantly over medium heat. add the dashi and cook for five minutes. in the meantime combine all the ingredients for the soup in a large pan and bring to a boil. cook the udon following the instructions. wash and clean the spring onions and finely cut the green parts. pour some of the udon noodles in each serving bowl. add some broth and top every bowl with some beef and spring onions. enjoy your trip to asia! das rindfleisch in dünne streifen schneiden und zusammen mit der sojasauce, dem zucker und mirin in einen topf geben. unter rühren bei mittlere hitze reduzieren. dann dashi dazu geben und fünf minuten köcheln lassen. in der zwischenzeit alle zutaten für die suppe in einen großen topf geben und aufkochen lassen. die udon nudeln nach den anweisungen auf der packung kochen. die frühlingszwiebeln waschen und das grüne in feine streifen schneiden. in jede suppenschale udon nudeln geben, mit brühe aufgießen und Rindfleisch und frühlingszwiebeln oben darauf geben. guten kulinarischen ausflug nach asien! This entry was posted in recipes, spring and tagged spring onion by The Cook. Bookmark the permalink.